Whether your application is PCR or LCMS, materials development or drug discovery, or anything in between – we have the solution to meet your needs. Our products deliver convenience, quality, and consistency and are the leading provider of chemicals and bioreagents to many research organisations in sectors such as academia, pharmaceuticals, biotechnology and healthcare. • High purity solvents tailored for specific detectors and applications. 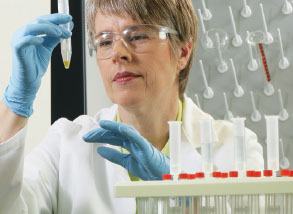 We provide a wide range of chemicals to support the endless possibilities of your research. The Fisher product range includes analytical and laboratory grade solvents, HPLC/GC solvents, buffer and volumetric solutions, AA standards and reagents. Alfa Aesar, now part of Thermo Fisher Scientifc, is a leading manufacturer and supplier of chemicals, metals and life science products for research and development. The Ajax Finechem product range extends to more than 4000 product lines including ACS grade reagents, high purity acids and solvents for HPLC, GC, Spectroscopy and Pesticide Residue analysis, volumetric solutions, pH buffer solutions ICP & AAS standards, certified ultra pure acids for trace metal analysis and a range of products for specific applications. Manufactured to Thermo Fisher Scientific specifications, the Pronalys range is unsurpassed for most laboratory needs and includes a broad range of analytical and laboratory grade chemicals, buffer and volumetric solutions. Acros offers a comprehensive portfolio of essential fine, organic chemicals and functional reagents which are subjected to meticulous purity analysis in the Acros QC laboratories. Maybridge portfolio offers a comprehensive range of chemistry products and services tailored to the drug discovery and biotechnology sector including a vast range of screening compounds and building blocks. With a product range that extends to over 300 individual products, the Fronine brand includes stains and solvents for use in Histology, Microbiology, Haematology, Cytology and Parasitology. The Serva range includes innovative reagents for molecular biology and specialties like collagenase for cell biology and products for electrophoresis. The Macherey-Nagel range of pH and specialty test strips and papers are designed for use in food, electroplating and water testing. Decon is the leading cleaning, decontaminating agent for laboratory, medical and specialised industrial applications. Liquid and dry concentrations are available for manual and machine wash.
RBS offers a complete range of high performance detergents for applications in all types of laboratories and industry in general.